Thankful to all my family and friends for the support and who make it all worthwhile! https://t.co/2p1X6jBQdP "I’d like to be pimps from Oakland or cowboys from Arizona but it’s not Halloween." Born and raised outside the Twin Cities, Sam attended St. Francis High School in St. Francis, Minnesota where she was a three sport athlete, competing in cross country, track, and soccer. 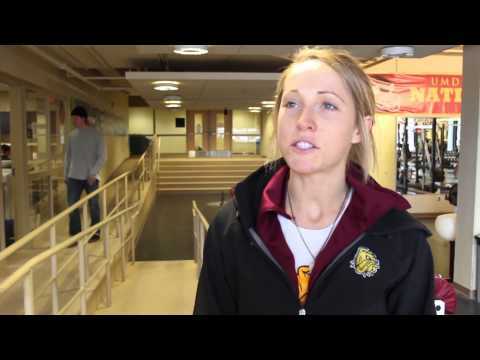 After high school, Samantha chose to stick to her Minnesotan roots, and transitioned to University of Minnesota, Duluth where she found success early, bringing home the DII National Championship in the Indoor 1600m in her first year with the Bulldogs. She would eventually tally up 5 DII NCAA All-American honors. Though the honors were plenty, Sam's favorite part about collegiate running was the memories she made with her team. After a stint in Portland, Oregon, Sam has returned to her Minnesota roots as she continues to pursue her running goals. Sam admins, "I try to be tough most of the time but Minnesota winters will make me break down and cry." Taking in her new sights and the interest in new challenges, Sam was part of the women's championship team at the 2016 Hood to Coast relay, where they finished the 199 mile course in 21 hours and 44 minutes.